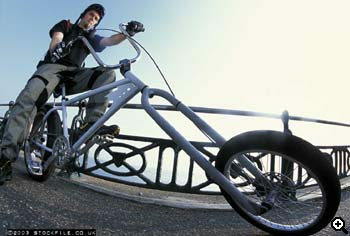 For some years, we at bikehotrod.com have been spying on an above-top-secret organisation codenamed Project Bikehotrod. The staff of this shadowy black budget research program design and construct hypersonic (mach7+) craft. Project Bikehotrod operates under a veil of secrecy. So bizarre and shocking is the appearance of the craft developed by the project that bystanders have frequently mistaken them for UFOs, chopper bikes, swamp gas, stealth fighters, or the famous Aurora recon prototype. However, over the past few years, photographs of Bikehotrod machines have occasionally found their way into magazines, newspapers and websites. Most secret of all Bikehotrod projects is the Dark Starfish. We managed to hack into the Project Bikehotrod mainframe (or duff laptop) to obtain detailed info and never-before-seen images relating to this prototype hypersonic test bed. We understand that the Dark Starfish is the product of an unusual collaboration. Project Bikehotrod received an offer of an entire main thrust unit (rear wheel and tyre) produced by another blackops group. In response to the challenge of this new and unfamiliar technology, Project staff developed and constructed a completely new airframe. The size and weight of the thrust unit necessitated the fabrication of a complete new rear triangle and, as you can see, Project scientists had to use the very finest old tubes to realise the necessary custom geometry. 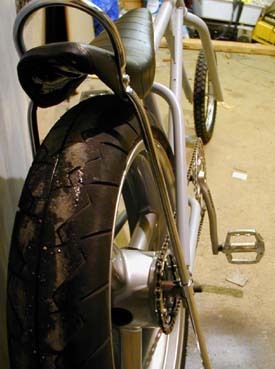 However, clever use of "off the shelf" componentry by the eggheads enabled the repurposing of a more conventional bottom bracket and cranks--although these standard components were found to provide barely sufficient clearance for the 120mm wide rear thruster transfer vectoring ring (tyre). Another genius-level bodge was the simple connection between the main thrust unit and a standard rotary-linear power linkage (chain). This was effected by bolting a convertor ring to disk rotor, enabling the attachment of a standard cog. 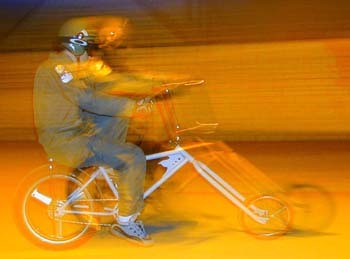 Initial test flights were attempted using transmission-effected retrothrust (pulling up on the pedals), but it was quickly realised that a front brake would be necessary for any sort of urban mission. After the fabrication of a custom 20" disk mounted wheel, the Dark Starfish was complete. "With no gears and lots of momentum, she's a handful alright!" "In a steep dive (downhill) you have to let off the main thruster input couplings (pedals). It's just real tricky picking them back up at the bottom..."
"With little or no weight on the front, braking is sketchy at best." But aircrew who have flown the Dark Starfish always get plenty of admiring looks, and the back wheel never stops looking cool. Bikehotrod.com continues its quest to bring to light the shadowy activities of Project Bikehotrod. Jezz Harty facilitated initial contact. Like 'em weird? Try this.